I always think women can either be really really easy to buy for at Christmas, or really really difficult! Even the same person. My Mum for example, some years I can have far too many ideas of what to buy for her, and other years I’m practically begging my Dad for ideas what to get her! 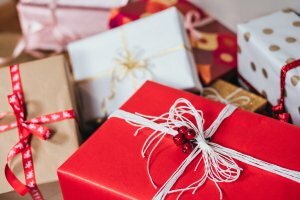 To save you a little bit of head scratching, I’ve put together a Women’s Christmas Gift Guide for 2018. Whether it be for your Mum, Nan, Aunty, Sister, Wife, Daughter, Next-door neighbour or best friend, hopefully there’s something on here to help you out. I love all sorts of quirky mugs, and it drives me husband mad when I get a new one, so I do have to reign myself in a bit, unlike fellow blogger Brummy Mummy of 2 (seriously, she has a bit of an addiction, check her out on Instagram!) This Emma Bridgewater Pink Hearts mug is a bit more of a subtle choice, but still a beautiful addition to any mug collection. 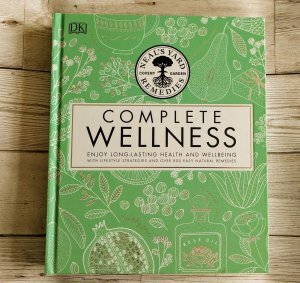 Neal’s Yard Remedies Complete Wellness is a fabulous book containing 800 easy natural remedies for over 170 common ailments, from calming anxiety, soothing stressed skin, boosting your energy levels, balancing gut flora, or easing a headache. With step-by-step guides to making your own natural remedies at home and 35 delicious recipes to support your overall wellness every day, Neal’s Yard Remedies Complete Wellness will help you enjoy long-lasting health and well-being the natural way. 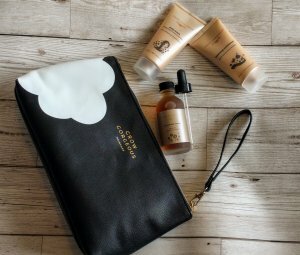 For those that love to take care of their hair, then this Three Steps to Gorgeous by Grow Gorgeous is perfect. Step one, Detox, which will thoroughly exfoliate, purify and detoxify the scalp. All of the plant-based actives in the Scalp Detox remove impurities and build-up which can block roots and disrupt hair growth. Step two, Cleanse, using the Grow Gorgeous 11-in-1 Cleansing Conditioner. It wont strip your hair of its’ natural oils but will improve shine, add volume and reduce frizz. Step three, Grow, the Grow Gorgeous Hair Growth Serum. Clinically proved to give visibly fuller, thicker and denser looking hair in just 8 days. 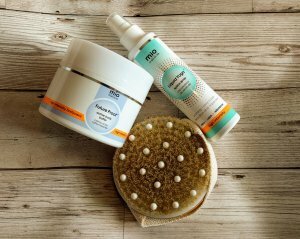 Mio Skincare provide a two-step routine for perfectly smooth glowing legs plus a wealth of health and well-being benefits in the Prep+Glow set, containing the Body Brush and Future Proof Body Butter . Body Brushing works to boost circulation, remove dead skin cells and improve digestion, helping the body to detoxify and remove waste, whilst moisturising helps to lock in vital hydration, acting as a temporary barrier for skin and helping to improve tone and texture. Perfect for someone wanting to look after themselves. Mio Skincare also have the wonderful smelling Liquid Yoga Homeopathic Space Spray Containing a blend of essential oils (Lemon, Cypress, Mentha Arvensis, and Lavandin) it helps to de-stress in an instant. The space spray can be used on pressure points, as a pillow spray or as a face mist that can help promote deep sleep and ease tension that causes headaches – Something I will definitely be using a lot! Spending some time engrossed in a book is wonderful at Christmas I think, curled up on the sofa, having eaten too much. You just can’t beat it. Martina Cole’s latest crime novel, Damaged , is perfect for losing yourself in a different world. 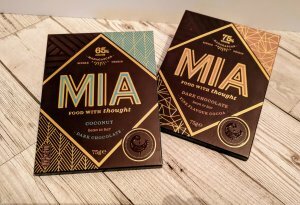 Whether she’s a chocolate connoisseur, loves to devour a bar in seconds, or savour every piece, then the new MIA Bookcase Gift Pack is perfect. Containing five delicious flavours – 75% Dark Chocolate, Candied Orange, Coconut, Cranberry & Hazelnut, and Almond & Coconut bars. If you know someone, like me, who loves a good notebook then the My Amazing Ideas by Happy Jackson is perfect for them, or for you! It’s great for keeping track of those New Year’s Resolutions, goals, shopping lists, things to do, holiday plans… the possibilities are endless. 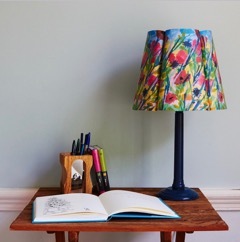 For those that like something a little unusual around their house there is the Papershades flat-packed paper lampshades. They arrive in an A4 envelope and are assembled at home; with instructions on the packaging and a ‘how to’ video on the website it’s super easy to do, and creates a unique look to any home. Papershades has a number of ranges available at the moment – Floral and Nostalgia being the main ones, and Ros is currently working on City designs, all of which are available on the website. If you like to go all out and completely decorate your house at Christmas, there are also some fab Christmas designs too! Is there anyone, other than me, who hasn’t seen The Greatest Showman yet? I don’t think I’ve come across anyone who has seen it who doesn’t love it. The DVD is perfect for those who are obsessed, and somehow don’t have a copy yet (or have worn theirs out already!) or for those who have yet to immerse themselves into the world of show business! 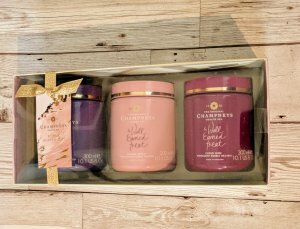 Champneys never fail to provide luxurious gifts, no matter the time of year, but I always think they are perfect for a Christmas gift. The Bubble Heaven Gift Set is a gorgeous bubble set featuring Champneys signature scents; Cloud Nine, Summer Dream, and Heavenly Days. Perfect for relaxing and unwinding after a busy Christmas. 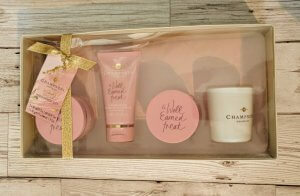 When the wind and rain has put paid to the plans of a walk after Christmas dinner, then a bath using the tropical mix of peach, mango, orange and passion fruit in the Champneys Summer Dream Indulgence Gift Set can transport her to sunnier climes. This set containing a butter soufflé, shower gel, salt scrub, and candle are the perfect way to relax and forget about all the washing up left over from Christmas dinner!